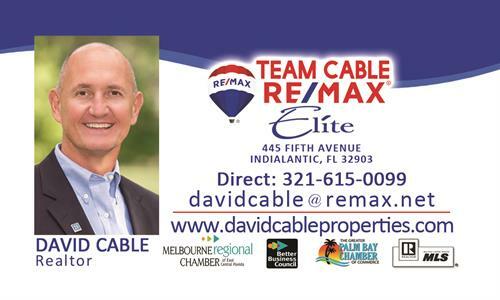 TEAM CABLE with RE/MAX ELITE takes pride in being Brevard’s full service realtor team. We provide professional, friendly, and impeccable service with the highest level of importance and attention to you. 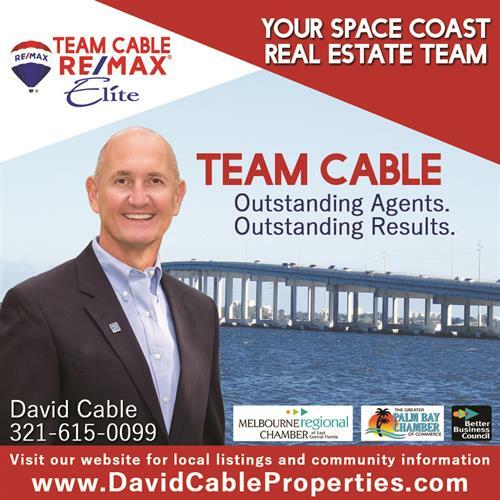 David Cable’s team and business partners will guide you through your selling or buying process with a commitment to getting you RESULTS. As a proud business partner with Brevard County Public Schools we are pleased to offer a special rebate for you, your family or friends. Partner with us to sell your current home or let us help you buy your next home and we will donate 20% of our commission to your school of choice. ***NOTE: Not to exceed $500. Contact me for details! CONTACT TEAM CABLE at (321) 615-0099.